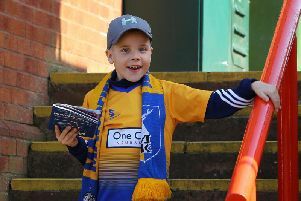 Mansfield Town are hoping the summer-high temperature of today dies down before kick-off in tonight’s home friendly with Premier League Hull City (7.30pm). Stags boss Adam Murray also said it would be interesting coming up against potential England boss Steve Bruce, the Hull managed having had informal talks with the FA over the vacancy ahead of tonight’s game. Temperatures have topped 31 degrees today and may still be over 27 by kick-off. So does Murray think that will affect his side? “Apart from us all playing in Speedos, no,” he smiled. “It’s obviously very warm. We felt the effects of it in training yesterday and, obviously, you’ve go to be a little bit careful in terms of the health side of things. “But we are hoping by the time kick-off comes it should be bearable. “It’s obviously great for them (Hull) to come down, probably more for the fans to see a Premier League team. From our point of view it’s another game in our preparation towards the start of the League Two season. Much of the off-field buzz tonight will be over the FA approach to Bruce following their interview with Sunderland’s Sam Allardyce. “He’s obviously done a great job at the clubs he’s been at. He knows how to win,” said Murray. “I was speaking about it with someone the other day. It’s been interesting to see how he’s always used his resources to win football matches. “Sometimes there’s been situations where he’s had to manage it in a certain way, but he’s always managed to be successful. Who does Murray believe should get the job? “Everyone will have a different opinion,” he said “Some will say let’s go out the box and go foreign to use their ideas. “I look at people like Eddie Howe and he’s fresh and new. He is successful, he’s worked within his resources, he has a certain way of playing. “Then you look at the other side of the spectrum and you have people like big Sam and Steve with bags of experience who have been successful throughout their careers, so why not? “Can you win or lose by it I don’t know, but knowing what English people want is a big thing – and that’s hard. Tonight will also see the return of ex-Stags winger Sam Clucas, who left the club for local rivals Chesterfield before a big money move to Hull. “Sam is a good guy and I hope the fans are good to him tonight, said Murray. “I don’t think for one reason and another we got to see enough of Sam. Murray won’t play anyone not fully fit tonight and said he may have a look at a couple of trialists too. “There’s still a couple of niggles and some we are not going to push tonight,” he said. “We have a couple more games after this one, so we’ve no need to rush anybody. “There will be no risk-taking. We might, depending on how the weather is, share the game time tonight as we are in training tomorrow as well. “It will be an intense session tomorrow so again it’s about getting match time for people that need it. But right now training ground time is just as important.